One of the best parts about being a musician is all the great people that we tend to meet in an ever widening circle of friends. We meet people who like our music, our style, what we have to say on issues, and of course those that don’t. We also tend to meet a large number of fellow musicians. With all the shows we perform, and those we go out to see, we’re exposed to a lot of music. The ideas, styles, songs and the people who share this path with us feed our creativity in ways that I wouldn’t have believed when the journey began. With all that exposure to music, you can’t help but fall in love with some of it. With that discovery, I’ve found that Michigan has an incredibly talented population of singer-songwriters. We don’t all have the same goals, abilities, genres. availability, drive, or touring territories, so there’s plenty of opportunities for all of us to play, grow, and catch shows on the rare times when we aren’t performing. Within this group, I’ve been cherry picking songs that I really admire, and gradually adding them to my own repertoire. 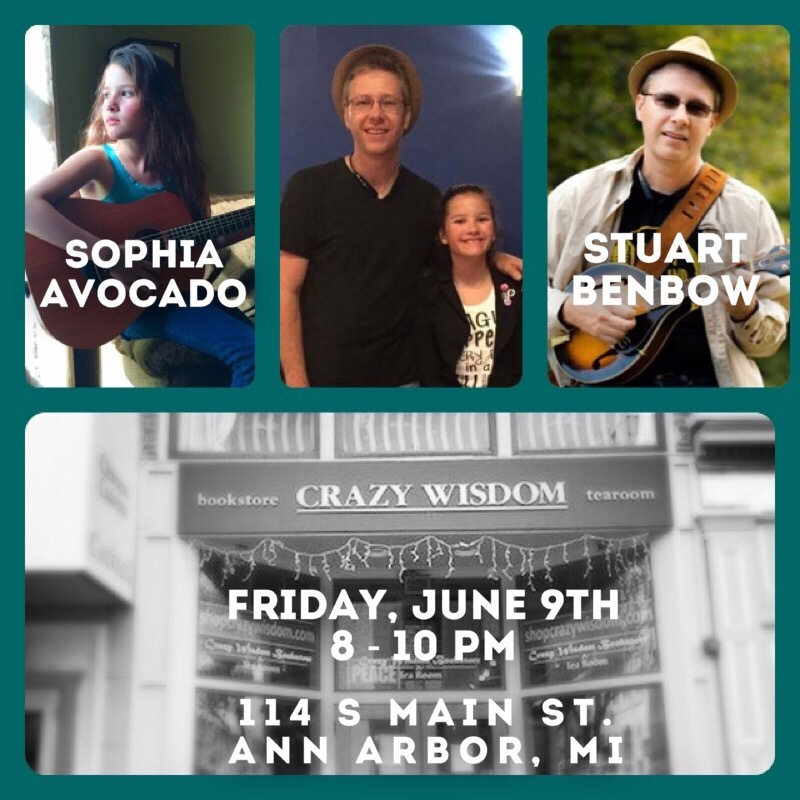 Coming up on June 9th, which is next Friday, I’ll be pulling out a batch of those favorites and performing them for the fine folks that join me at Crazy Wisdom, in Ann Arbor, MI. Sophia Avocado, a brilliant young performer I met last summer, will be opening for me at 8pm. My set will be a blend of my own material, and covers of those Michigan Artist songs I’ve become addicted to. Artists covered will include Judy Insley, Annie Capps, Blaise Glander, The Accidentals, and The Potter’s Field. The hope is that the audience will enjoy my small sampling of their music, and seek out more after the show. I’ve learned a lot as a songwriter and a performer from watching each of these artists work and grow, and each has helped guide me along the path in various ways.